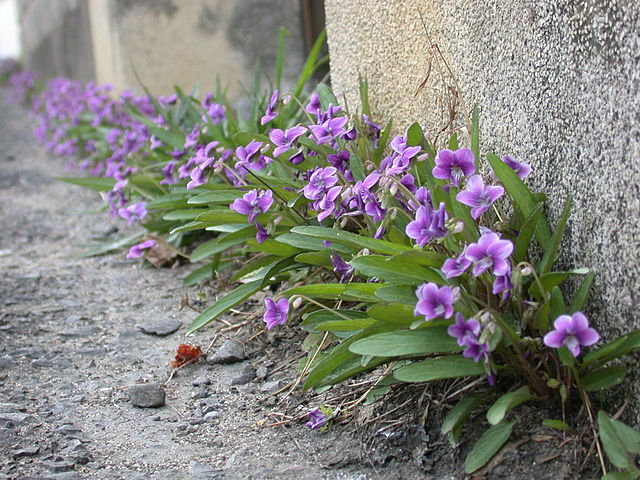 Viola mandashurica is called sumire in Japan. Viola mandshurica families is generically called Viola mandsshurica. This flower is a perennial plant and lives nearly all over the world. There are about 500 species, of which about 50 species’s grow in Japan. The flowes’s color is dark violet. Sumire can grow to a height of about 10~15 centimeters. The leaf is 4~8 centimeters. The handle is long and have wing the upper top pert. The flower is come out in April between May. Sumire have many species and indistinguishable. It is very difficult. Also the flower is symmetry and flower petal is five. Many Sumire’s species is make close flower in usually flower’s close after. And it is go underground. It called Viola mandshurica. Sumire is “Akane sumire”,”Ki sumire” and “Tsubo sumire”,and the like a general term. By “Sumire” is say simple substance or belongs to the Sumire family. Then called “Mandshurica” when Sumire is independent species only. But this ,”Mandshurica”’s name is not decided. Sumire is live in about all over the world. This flower is grow in the mountainous region and a field in Japan. And this flower grows is distributed throught Hokkidou , Honsyu(the main island of Japan), (the island of)Shikoku and Kyuusyuu. And Sumire can live in many various grows places. For example, not only in the well lighted a field, in a forests, a lost territory, the sea shore’s dune and alpine conglomerate… In this way Sumire is very different therefore a kind. Sumire’s group is high adaptability and have evolved a great variety of Sumire’s group. Sumire’s nectar is sucked by a bumblebee’s group and ants. So Sumire’s pollen are carried by these insects. Sumire’s group have pheromone. For example, “Katakuri” has this pheromone. This component is used for ants. Simire’s flower is growed up for an ornamental plant. For example, “Nioi Sumire” and “Sannsiki Sumire”. In Japan, Sumire’s flower is very beautiful. Sumire is many species and many different name, but it is fond of many people.Sumire is high pollinated plant. And this plant grow at a sunny place. But it is move at the shade at morning. Because the leaf get sunburned and yellowish. Also Sumire get sick. The name of a disease is “Souka byou”,”Udonko byou”. This disease is Sumire’s leaf made white. So it is avoid rain. It is important. When damage a thing, seeds are gather. And it have the care of a refrigerator. Sumire have very many species and high adaptable ability. If you would like to see Sumire, go to field in spring. And you visit in Japan possibility. Be sure Sumire open the flower everywhere! So you can see the beautiful followers! Next Kochi Organic Market in Ike: Let’s Eat Organic!